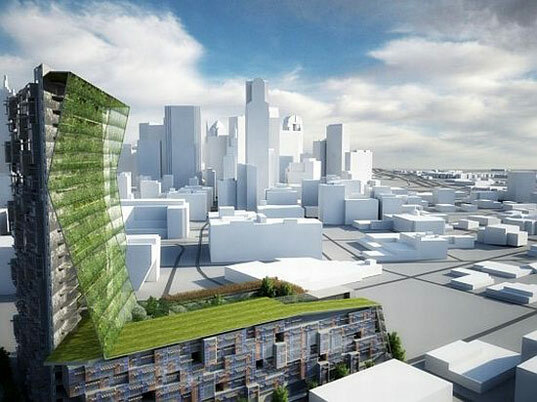 Charlotte, North Carolina-based architecture firm Little Diversified Architectural Consulting has conceived of an incredible project that transforms a vacant parking lot in Dallas into a completely self-reliant eco-city. 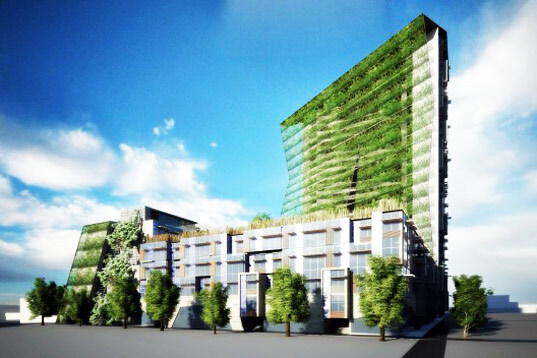 Dubbed the Entangled Bank, the project features a green-walled citadel emblazoned with solar panels, an agricultural field, and an extensive system for greywater treatment and recycling, providing its residents with sustainable sources for food, water and energy. Little Diversified Architectural Consulting‘s project was recently was named one of the finalists in the Re:Vision Dallas international design competition, in which participants were asked to transform a parking lot spanning one square block into one of the world’s most sophisticated models for sustainable urban development. Little conceived their plan for the mixed-used development based on Darwin’s “Entangled Bank” theory, in which a complex network is made up from simple elements. The community was designed to be completely self-reliant through a series of innovative sustainable techniques and the efficient use of natural resources. Made up of residences, retail, and educational components, the complex also includes communal sky pastures, 80,000-square-feet of vertical farmland, and a 20,000-square-foot grain field that provides food for the city’s inhabitants. The structure itself uses photovoltaic panels on the southern facade to power the residential units within the building and includes a series of vertical axis wind turbines to provide power to the central development. Energy needs aside, the architects also incorporate greywater treatment facilities on the premises that recycle and redistribute used domestic water and retention ponds to capture water runoff into their design for a sustainable city.